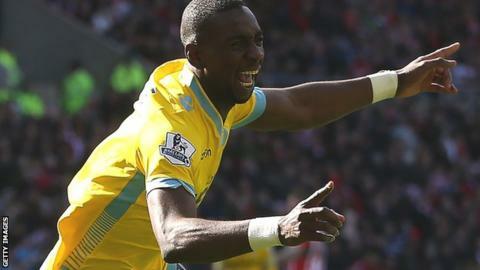 Crystal Palace winger Yannick Bolasie has signed a new three-and-a-half-year contract at Selhurst Park. The 26-year-old was linked with Tottenham in the summer but manager Alan Pardew says Palace received no bids for him. "There was no bid but we know, if he was available for £5m, we'd have a queue from here to wherever," he said. "He's a lot more money than that, and now we've got three and a half years he's worth a lot more money." Pardew admits that the former Bristol City man could end up leaving the Eagles - if he can improve his end product. Bolasie has scored just seven league goals for Palace - who face Watford on Sunday - since joining in 2012. "I've said all along that this guy needs to deliver the final moment, and when he does that he won't be here in three and a half years," said Pardew. "If I can develop him and take this club forward, that's great. Then if a big club comes we use that money to take the club forward. Simple equation."